The five-storey property, situated on Rathausstrasse/Bergstrasse/Hauptstrasse, was built in 2007. It has a total lettable area of around 6,500 square metres. Doctors’ surgeries and offices on the upper four floors make up ca. 5,200 square metres, with 1,300 square metres of retail accommodation on the ground floor. Most of the tenants are medical practices, while others include a pharmacy and the Kamps bakery chain. The property is currently 95% let, with a weighted average unexpired lease term (WALT) of more than five years. BFS Service advised on the transaction on behalf of Principal. DLA Piper LLP provided legal advice and ChandlerKBS was responsible for technical issues. Principal Care Invest II is an open-ended real estate special AIF with health care properties, targeted on institutional investors. The objective is to establish and manage a balanced and regionally diversified portfolio of health care properties, with long-term value stability. 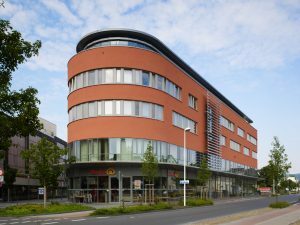 The investment focus is on care homes, outpatient facilities, sheltered housing and includes rehabilitation clinics with psychiatry, gerontology and oncology functions, as well as medical care centres in Germany. The individual lot sizes the fund is targeting include properties between EUR 7 and 20 million for care properties and sheltered housing, and between EUR 10 and 30 million for rehabilitation clinics and medical care centres. The majority, between 60 and 75%, is to be invested in care homes and sheltered housing. The fund, which was launched at the beginning of 2018, has a planned investment period of three years. Principal is part of the US Principal Real Estate Investors, the real estate investment group within Principal Global Investors, based in Des Moines, Iowa. Prin RE, which has almost USD 75 bn of assets under management, ranks among the top 10 real estate managers worldwide.